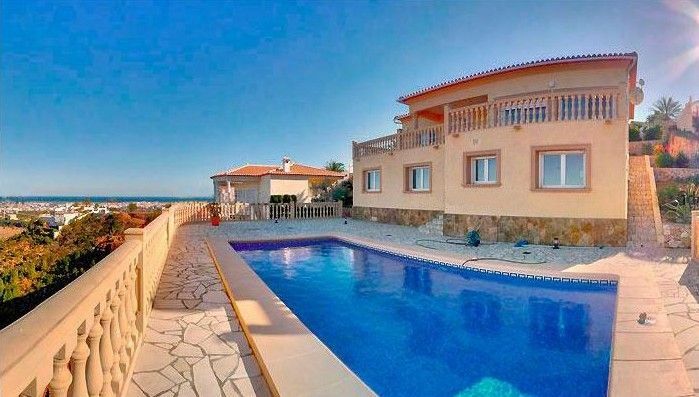 Beautiful, very modern villa with breathtaking, unobstructed 180 degree sea views and beautiful pool for rent. The house was completed in 2005, always well maintained and equipped with high quality furniture. The equipment and execution of the baths corresponds to the German standard. The villa is located in one of the most exquisite residential areas of Denia (Marquesa VI) on Mount Montgó. The house is built on a slope, below the property is a beautiful open space with palm trees, various types of flowers and of course the typical orange trees. Kitchen, satellite TV, stereo) with sea view, and a guest toilet. A very large, partially covered terrace connects directly to the living room and invites you to start the new day with an outdoor breakfast. In the basement there are three bedrooms, which are yellow, orange and green in the summer colors and also all have a fantastic sea view. On this level are also two bathrooms (shower & bath), two more toilets and a laundry room. From this floor you reach another terrace made of natural stone with the tiled 8x4 meter pool. The whole house is equipped with a separately controllable floor heating. A carport in the entrance area and a laundry room with Miele washer and dryer in the basement complete the offer. Surroundings: The center of Deniás is about 4 kilometers (about 10 minutes by car) from the villa. With a first visit of the castle from the 11th Century and a look into the cool church rooms in the historic center invites you Dénia to indulge yourself completely in the lifestyle of the Mediterranean and forget everyday life. Take a leisurely walk from the promenade along the harbor to the clean beach area in Las Rotas and relax in Las Marinas on the kilometer-long sandy beach while sunbathing, swimming, diving or other water sports, because in Dénia you will find everything the holidaymaker's heart desires. In the evening: The city only awakens to joyful mediaterranem life after 22. 00 - experience the shimmering-warm nights with a stroll in the old fishing quarter, where many bars invite to stay and maybe even to a spontaneous guitar concert. More than 400 fiestas take place throughout the year on the Costa Blanca, so it's best to find out in good time how to attend such an event during your stay. For nature lovers, Montgó's local mountain offers fantastic opportunities. Various hiking trails lead you along small mountain rivers to magnificent viewpoints. or relax in the refreshing pool: you may be lucky and even see fireworks from your privileged panoramic area. "Schönes grosses Haus mit viel Platz.Ideal für Familien mit Kindern. Sehr ruhig gelegen, jedoch nur 10 Minuten von Denia und weiteren grossen Einkaufsmöglichkeiten weg. Auto ist zwingend notwendig. Die Besitzer sind äusserst nett und zuvorkommend. Wir würden jederzeit in diesem Haus nochmals Ferien machen." Ein fantastisches , sehr sauberes Ferienhaus mit tollem Pool und einem fantastischen Ausblick! Das Haus hat alles was man braucht, in der Küche ist alles vorhanden und alle Geräte sind hochwertig. Die Klimaanlage und die Fliegengitter an den Fenstern waren für uns sehr hilfreich um auch gut durchlüften zu können ohne Mücken im Haus zu haben. Der Pool ist klasse und die Terrassen sehr gross. Der Strand , Einkaufsmöglichkeiten und Restaurants sind gut erreichbar. Wir hatten 2 tolle Wochen dort!! Ein wunderschönes Haus mit fantastischem Ausblick. Sehr gut eingerichtet! Es hat an nichts gefehlt! Nous avons passé un très agréable séjour de 15 jours dans cette très belle villa sur les hauteurs de Dénia. La maison est très bien entretenue, très propre et conforme à sa description. La piscine est spacieuse, très ensoleillée, bref très agréable. Environnement calme, bel espace de vie intérieur propre, neuf et bien équipé et très agréables terrasses où l'on peut se détendre et admirer la vue sur Dénia et la mer. Rien ne manque. Même à l'extérieur avec les différents mobiliers (salon, table haute...). Nous avons été très bien accueillis et nous recommandons les yeux fermés cette location ! Nous avons passé des vacances très agréables avec nos 3 enfants. La vue sur la mer est magnifique, surtout la nuit. Situé dans un quartier très calme, la villa dispose de tout le confort que l'on peut souhaiter. Experience from this luxury villa at the foot of Montgós the beautiful view of the 'white coast' (Costa Blanca) with its small bays, gently sloping mountain formations and orange groves. The phrase 'as far as the eye can see' takes on a whole new dimension: on a clear day you can see the island of Ibiza in the panorama of white sails between Cape Cullera and the romantic Moorish fortress, Denias landmark. After sunset, the scenery changes. A sea of ​​lights illuminates the landscape below you and invites you to enjoy tapas and a glass of Rioja until the early morning hours this enchanted view, in which the boundaries between land and sea as if in a dream blur. Golf: In the immediate vicinity, just a few minutes drive away, 3 golf courses can be found. Particularly popular is the golf course of La Sella with a 27 hole course.